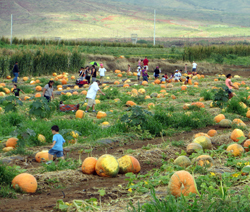 Visit a real Pumpkin Patch and Start your Hawaii Holiday Season. 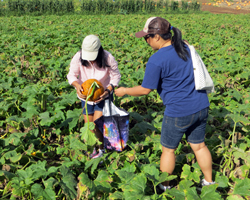 Hawaii Pumpkin Patch Harvests Holiday Farm Fun! 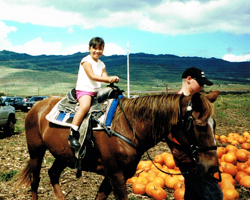 Admittedly, the pumpkin festival at Aloun Farms pumpkin patch in Kapolei probably isn’t the first Hawaii vacation activity on your Oahu tourism itinerary. So this information might be of greater benefit to the local families who are looking for cheap Hawaii things to do. 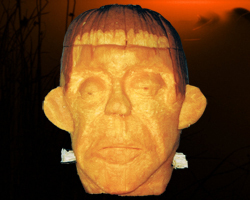 But if you’re really into Halloween traditions, you can still carve up a seasonal scare in your home away from home. Or if you usually get your pumpkins from a storefront pallet or a hay-strewn parking lot – or worse still… from a can – then perhaps a quick trip to the country is exactly the experience that will make your visit unique! And don’t worry; you’ll still have time for the beach… Because our island really is quite small, it takes only minutes to go from town to country (and back to Honolulu again). 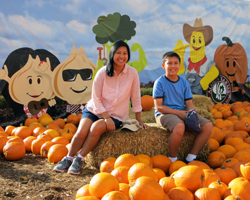 So if you’re here for one of the last three weekends in October, and you want to experience some family-friendly farm fun, you can find it at our Hawaii pumpkin patch. It’s not free; but it’s really inexpensive. 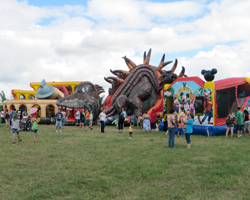 What's more, the admission includes free parking, live entertainment, and hay rides all day! So at only $2 per person, I think this is actually a better deal than when they used to charge for parking and hay rides individually. Additionally, the event keeps getting bigger and better every year! This public pumpkin picking event allows you to walk straight out into the middle of the pumpkin patch and pull your jack-o-lantern-to-be right off the vine. With more than a dozen varieties of pumpkin, you’re sure to find a grand gourd. The most popular varieties, however, seem to be the traditional orange or a similarly-sized all-white pumpkin (which glows under black light). They seem to have every size, color, and texture variation you can imagine. I’ve never seen any truly enormous pumpkins (100 kg or more) at this patch; but the selection of large ones is much better than in years past! 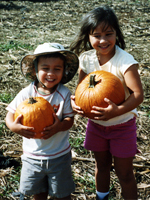 The Aloun Farms pumpkin patch sells their pumpkins at a menu rate according to size (with four or five size/price variations). Furthermore, because you’re buying directly from the farm, the prices are generally better than if you purchase by the pound from a market. 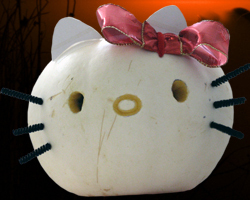 The smaller pumpkins are less expensive, but even the very largest are still quite reasonable. 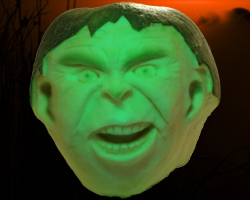 For example, my friend bought a pumpkin weighing 90 lbs (more than 40 kg) and it only cost him $20! Meanwhile, we bought six regular-sized pumpkins – also for $20. That’s hard to beat! The prices will vary from year to year, but I doubt you’ll find a better deal in a store. The pumpkin patch is part of a real, working produce farm. That means there’s lots of real farm dirt. It’s dusty when dry and muddy after a rain. One way or another, you’re going to be rusty brown by the time you finish; and this dirt never washes away completely (local clothing designers have actually dyed “Red Dirt” T-shirts with it for exactly that reason). With this in mind, you should dress accordingly. Wear your worst clothes; and you might even want to bring some baby wipes and/or towels. Another element that’s absolutely necessary for farming is sunlight. And that means there’s very little shade. You’ll get hot and thirsty out there. Wear protective clothing, apply sunscreen, and consider bringing your own water (or you can purchase refreshments at the event). I bought a large scoop of pumpkin crunch ice cream ($1). It did nothing for my thirst, but it was so tasty! Then I bought a drink. There are no shopping carts at a pumpkin patch. Bring bags, buckets, wagons or wheelbarrows to help you carry the produce you pick. They do have wagons for rent, but I don’t know if they’ll let you roll the wagon past the exit and out to your car. To be safe, I’d suggest having a plan of a-pack. Bring cash. It’s a farm. They’re not set up for credit card purchases. However, they did have a couple of automated teller machines (ATM’s) on site. First time I’ve seen that on a farm. If you’re hoping to do some relatively intricate carving (like I tend to do) you’ll need to choose a large pumpkin to ensure sufficient thickness of the shell walls (rind). 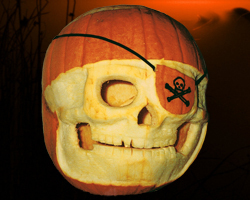 The porch-life of a jack-o-lantern in Hawaii is somewhere between 12 and 36 hours. If you live in a place where they have those things called “seasons” this may come as a shock, because you can probably leave your carved pumpkins on the porch for two weeks or more. But we don’t live in a seasonal refrigerator here. The climate is warm. The humidity is high. And the mold spores are happy – especially when they land on a warm, moist, freshly carved pumpkin. 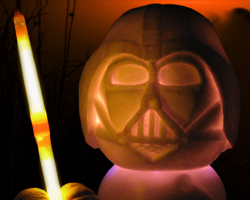 You’d be amazed how quickly jack-o-lanterns transform from a solid shell to a spongy, orange and black blob of goo. The above point applies only to pumpkins that have been carved. As long as you leave the skin intact, your pumpkin will stay firm and fresh until the end of the month. 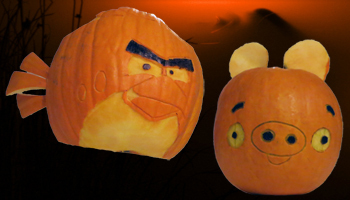 As a result, I’d recommend waiting until October 31 (or October 30 at the earliest) to carve your pumpkin. If you absolutely must carve it earlier, you’ll need to accept its early demise. However, you can preserve your jack-o-lantern a little longer than usual by keeping it in your refrigerator and/or slathering it with lemon juice. Finally, if you want to fill your refrigerator, there’s a fine selection of self-pick produce including corn, sunflowers, kabocha squash, and string beans. Additionally, they have a fresh produce market where you can purchase locally grown melons and vegetables. It’s all delicious. 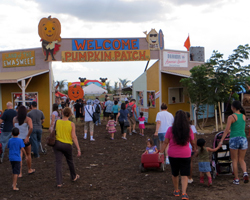 If you're out on the Windward side of the island, there's another Pumpkin Patch across the street from Waimanalo Beach Park at 41-225 Lupe Street. Similar deal… Saturdays and Sundays in October; 9am-5pm; free admission; fees for activities such as pumpkin picking, hay rides, cow train ride, sunflower maze, etc. I've never gone to this one, so I don't know more about it than that.